We’ve taken a look before at an energy speech by the Secretary of State at the Department for Energy (DECC). On that occasion his CBI speech wasn’t much fun. So we were delighted to read that he’s been back to the CBI with another speech. And is there a difference? Well, yes. It’s better. 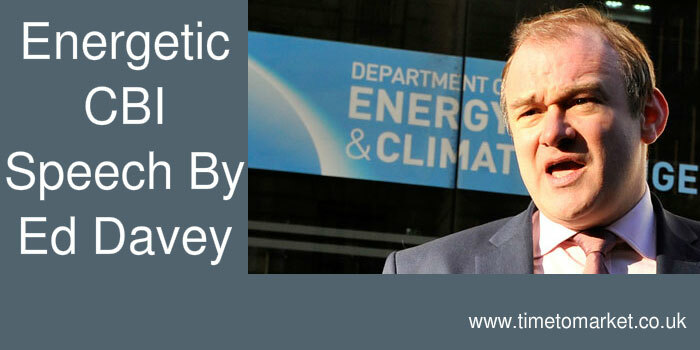 Ed Davey gave his CBI speech at the CBI Energy Conference in London last week. He began well with an introduction that mixed humour and some good name referencing that included Bob Geldof. The “f” word association with Mr Geldof then allowed him to get straight into another “f” word…fiscal, as in fiscal deficit. Neat. This led into some good use of repetition combined with appropriately short sentences. A good beginning. And as I want to demonstrate today – energy and climate change policy is one of the drivers of Britain’s new balanced growth. Because it now places Britain not just as one of the most attractive countries to invest in energy infrastructure – in the world. For our move to low carbon market mechanisms is first reducing subsidies, then requiring investors to compete for ever lower subsidies and then will see such subsidies reduced to zero, as new technologies like CCS and offshore wind mature and become competitive in a world where carbon will be properly priced. For in almost every other area of energy policy, the legacy left by Mr Miliband in 2010, was woeful. Verging on the negligent. Negligent on markets and energy prices. Negligent on low carbon energy investment. And negligent on energy security. Overall, it was good stuff. But there were still some horrors here. We’ve noted before the management speak of government departments. Their favourite words. 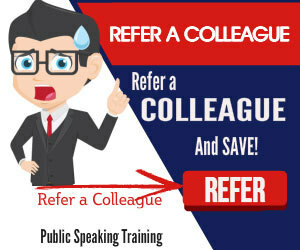 Their favoured phrases, such as, taking forward, going forward or delivered. While New Labour had taken forward the process of privatisation. …and we are taking forward his recommendations rapidly, not least in the Infrastructure Bill, now before Parliament. Interconnection projects worth £1bn have been delivered. Let’s not forget, of course, there’s diversity. Whatever the speech, you’d can guarantee that a Minister of the Crown will include the word, diversity, in their speech. It’s an utter favourite. Miliband failed to challenge the excessive market power the Big 6 had been accumulating. And consequently diversity and innovation decayed. Diversity is the wrong word here. How about, choice? I’m pleased to report we have a strong onshore wind investment pipeline. The households of Britain embracing the power we are putting into their hands. This was certainly a better CBI speech than Ed Davey’s energy speech of 2012. The Secretary of State certainly appeared to have got to grips with the problems of energy security, energy competition and climate concerns. If UKIP and those on the climate change denying, Europhobic right are able to hold the next Government hostage, and Britain turns away from the low-carbon path and turns away from the European Union, we could see investment melt away. Not just in energy, but across the piece. Because who will want to invest in a back-ward looking, isolated country in denial of global truths. Inconvenient though such truths may be. Did the Secretary of State think of this at the last moment? Or perhaps, did a political aide add something to this CBI speech? The latter, I suspect. The cleverness of the Al Gore (“An Inconvenient Truth“) reference is trite at this stage of his speech. Instead I’d expect him to wrap up the many good points made in the speech. Summarise the successes and point to future rewards. Instead he resorted to name calling. Really. All in all, though, this is greatly improved material from Mr Davey. 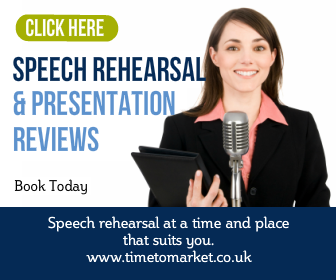 If you need to plan a CBI speech or another conference speech, don’t forget that you can always rehearse your speech with a public speaking skills refresher. Why not call when you need more details.